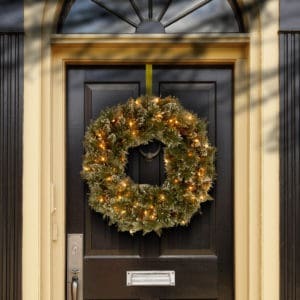 No home is complete at Christmas time without a festive wreath on your hallway door or a snowy Garland over your hearth. Browse our huge selection of Garlands & Wreaths – either as the ideal gift or for your home Christmas decorations. From fruit laden colourful creations filled with bows and ribbon, cinnamon and berries, to the more subtle, simple styles with minimal fuss, you will be sure to find the perfect garland or wreath. Please browse, purchase online, and get prompt delivery in time for Christmas. Some people like to keep it simple, some can't go without all the frills. 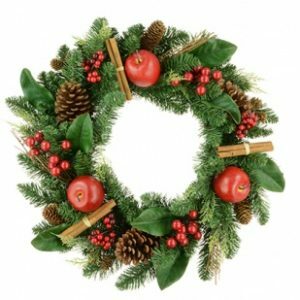 Whatever your preference, here at Christmasland, we have a huge selection of the very finest quality Christmas wreaths and Christmas garlands to choose from. From fruit laden colourful creations filled with bows and ribbon, cinnamon and berries, to the more subtle, simple styles with minimal fuss, you will be sure to find the perfect garland or wreath for you this festive season. You can purchase online or call our showroom on 01 2960212 where a member of our helpful staff will be delighted to assist you. Check also Ireland's best range of top quality artificial Xmas trees.